Why not spoil the ones you love with the ultimate gourmet breakfast? Or buy it for yourself and hope someone will make you breakfast in bed! 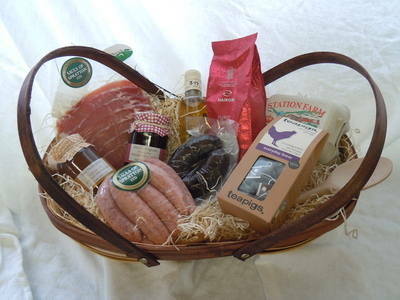 Either way, this glorious hamper contains everything you need for the start to a perfect day. Beautifully presented in a gorgeous rustic garden trug, cellophane wrapped and trimmed with raffia bows, this hamper is a perfect gift ready to go. Please order two weeks in advance. If you would like to order ten or more, please contact the shop for more information and special deals.